This workshop manual is suitable for the home mechanic or professional technician. Suitable for Nissan Exa N13 Series with CA16DE engine. 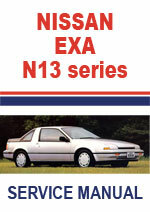 Nissan EXA N13 Series Workshop Service Repair Manual $5.99 Immediate Download!